James is really the one with a weekend breakfast ritual, although we both take it seriously. I like to treat myself to something special on Saturday morning, but he’s made almost a tradition out of having toast, eggs and hashbrowns with entirely too much ketchup. He may fry up frozen hash or make his own from potatoes, he may make an elaborate omelette or a quick scramble, but he works within a set of parameters. I was having eggs on this particular weekend, but my execution (above) bent his rules too much. So, as often happens side-by-side we cooked separate meals and ate together the breakfast that each of us wanted. James: Mutli-grain toast and butter, basil scrambled eggs with tons of Parmesan on top, garlic grilled tomato slices, coffee. 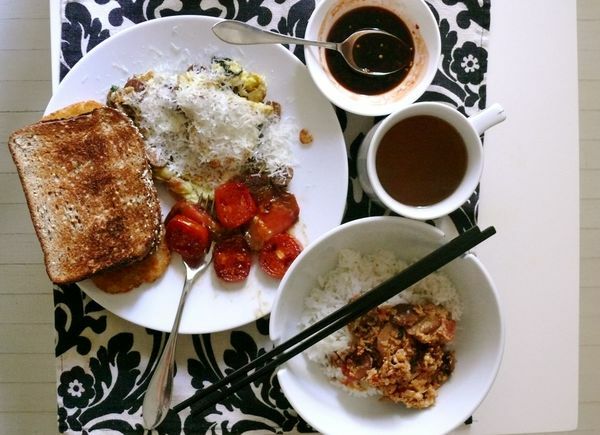 Me: Freshly cooked scented rice, tomato, tamari, basil and scallion scrambled eggs with black vinegar, sambol olek and soy sauce on the side and Jasmine tea. Similar and also quite different breakfasts, depending how you look at it, for two people I could say the same thing about. It works.